Mosquitoes are known as one of the deadliest animals in the world and for good reason. Every year, millions fall ill due to vector-borne disease, including malaria which kills more than 400,000 people yearly. Abt has been working to thwart these threats to global health security, and we showcased research on vector control for malaria, findings from the USAID-funded and Abt-implemented Zika AIRS Project (ZAP), and more at the American Society of Tropical Medicine and Hygiene (ASTMH) Annual Meeting from Oct. 28-Nov. 1 in New Orleans. The conference brought together over 4,000 researchers, professors, government and public health officials, military personnel, physicians, and others working in the fields of tropical medicine, hygiene and global health. 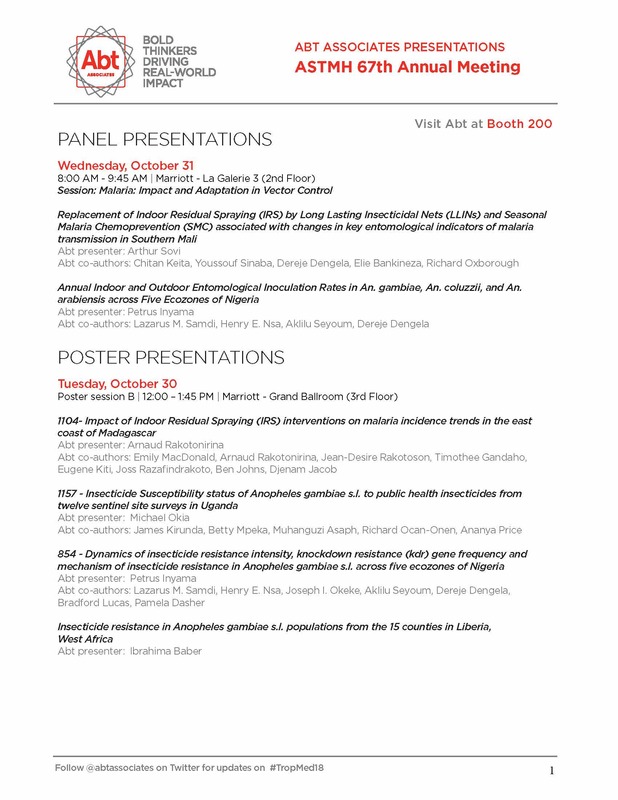 Click on the image below to view a full list of Abt presentations at ASTMH.